Core: Command scene.load_from_path executed in auto.cfg now works properly. Core: Fixed items not always being properly destroyed. Core: Fixed Tags 3D garbled text occurring in some scenes when closing an open window. Parts: Fixed Tags 3D blinking when tag values change. 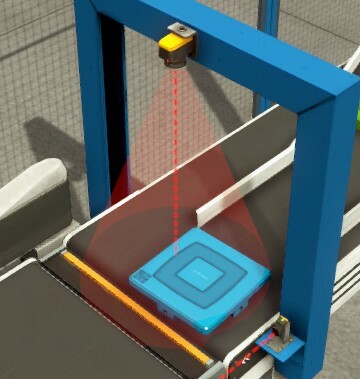 Parts: Fixed RFID reader field being detected by sensors. Parts: Fixed RFID tag memory not being cleared on scene reset. Core: Fixed offset between graphics and physics objects when window is resized. Bug introduced by resolution scale feature added in version 2.3.3. Core: Fixed console not displaying properly text lines made of a large number of characters. Core: Fixed OPC driver dependencies not installing correctly. Core: Undo and redo system can now handle tags properly. Core: Fixed undo commands not recreating groups after deletion. Core: Invalid placed parts/items are now automatically deleted before saving a scene. Parts: Fixed minor visual artifacts on several parts and items. Parts: Free Roller can now rotate in any direction. Parts: Fixed RFID tags of boxes being out of place when created by emitters with Random Part Orientation set. Parts: Fixed Selector not loading correctly when Configuration is set to 3 Position (A) or 3 Position (B). Parts: Fixed Palletizer elevator not moving when Moving to Limit is set to true and Elevator (+) and Elevator (-) is set during the same controller scan. Drivers: Fixed OPC UA duplicated nodes when browsing some servers. Drivers: Siemens analog values are round to closest integer when standardizing WORD (Numerical Data Type). Control I/O: Fixed SHR when input is 0. Core: Added Resolution Scale to Video Options. This feature allows to increase performance by lowering graphics quality. Useful when running Factory I/O on low-end graphics cards or at high resolutions (higher than Full HD). Parts: Fixed an offset between graphics and physics of the Elevator's platform. Parts: Fixed Two-Axis Pick & Place gripper sensor triggering when rotating arm at forward position. Parts: Direction arrow (white) of Curved Conveyors point to the selected direction. Parts: Chute Conveyors physics no longer interfere with other parts place next to them. Parts: Fixed Machining Center Robot not pausing correctly. Parts: Machining Center Robot no longer drops items when running the simulation at lower frame rates. Scenes: Fixed vision sensors of the Separation Station not detecting parts. Drivers: New OPC UA Driver. Documentation: New Tutorials and Samples for CODESYS with OPC UA and CODESYS with Modbus TCP. Documentation: Overall improvements made to CODESYS OPC DA tutorials and samples. Core: 3D tags include now a tooltip which displays the tag name and type (sensor/actuator). Core: Adds console commands driver.apply_current_mapping_to_all() which can be used to copy the tags mapping of the current driver to all drivers. Core: Fixed graphics issues when running on OpenGL. Core: Fixed graphics artifacts when running on video quality profile set to Very High. Parts: Fixed Light Array sensor not working properly when rotated using the rotation gizmo. Parts: Fixed Retroreflective sensor graphics (dashed line) not matching the sensor range. Parts: Curved Belt Conveyors now run at a fraction of the performance cost when compared to the previous version. Parts: Fixed Two-Axis Pick & Place minor graphics issues. Parts: Removed Conveyor Scale noise on weighting value when without load. Parts: Fixed RFID Reader not detecting tags when placed at some zones of the detection field. Parts: Improved RFID Reader field graphics. Parts: Added visual indicator to RFID tags used to show when a valid command is executed on a tag. Parts: Fixed Elevator not working after being rotated. Parts: Fixed Metal Lids not stacking correctly. Parts: Two-Axis Pick & Place can now handle correctly metal items. Parts: Inductive sensors no longer detect FP camera (when enabled by the console command camera.fp_camera = 1). Parts: Vision Sensor field graphics now match the sensor frustum. Core: Fixed several issues when executing undo commands with several parts selected. Core: Fixed being able to enable FP and fly cameras when TimeScale was active. Core: Fixed context menu not showing when using FP or fly cameras. Physics simulation has been heavily optimized allowing those looking to squeeze out every drop of performance from Factory I/O to simulate even larger scenes. Physics accuracy and stability have also been improved, no more pallets twisting on roller conveyors! Factory I/O v2.3 introduces the concept of time scale which allows a scene to be run at 0.1x (slow motion) up to 4x (fast forward). The 2.3 release includes also eagerly-awaited new parts such as curved conveyors, inclined belt conveyors, RFID, a new selector, metal items, safety door, new two-axis pick & place mode and a low frequency incremental encoder for conveyors. Core: Major performance improvements when using EngineIO.dll (Factory I/O SDK). Core: Fixed camera reverting back to orbit when switching from driver menu to scene. Core: Tags forced and error status values are now properly copied when using Duplicate and Copy/Paste commands. Core: Cameras Window will default to initial position when Factory I/O window is resized. Core: Orbit camera can move outside the warehouse environment. Core: New editor grid that matches the part editing grid. Core: Added support for network paths to the scene.my_scenes_path console command. Drivers: Allen Bradley works properly when reading 16 bit integers. Drivers: Detailed Modbus error messages are now displayed on Console (requires app.log_to_console = 1 to be set in the console or auto.cfg file). Drivers: Allen-Bradley driver I/O points are now darker when not valid to be easily distinguished from valid points. Drivers: Adds support and template projects for S7-PLCSIM V15. Drivers: Number of digital I/O points increased from 128 to 256. Drivers: Number of analog I/O points increased from 32 to 64. Drivers: Fixed OPC client exception when linking different data types. Drivers: Added actuator simulation tags to control the simulation state: Run, Pause, Reset and Camera Position. Licensing: License hostids are now properly printed. Installer: Factory I/O no longer requires the installation of Visual C++ 2010 Redistributable. 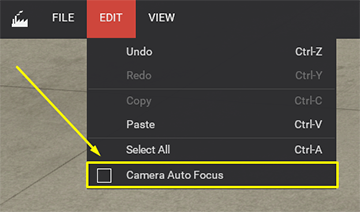 UI: Camera auto focus can be enabled/disabled on Edit > Camera Auto Focus. UI: Added Show Stats option to View menu. UI: Vastly improved performance of the driver window when loading and displaying a large number of I/O points. UI: Improved performance when displaying a large number of docked tags. UI: I/O point sockets are more noticeable when in a disconnected or error state. UI: Fixed inconsistencies in the driver window user interface. UI: Added help button to the driver window. Parts: Sounds volume leveled for all parts. Some sounds replaced by new ones. Parts: Vision sensor now displays field of view. Parts: Emitter now produces items near the bottom to reduce bounciness when emitting over moving conveyors. Parts: Added red mark indicating origin to the Two Axis Pick & Place gripper. Parts: Machining center: an error is flagged when an invalid item is detected at the entry bay. The station can be restored to normal operation by pressing the reset button. Parts: Resized Stackable Box to fit in Square Pallets. Camera: Increased orbit camera maximum zoom distance. 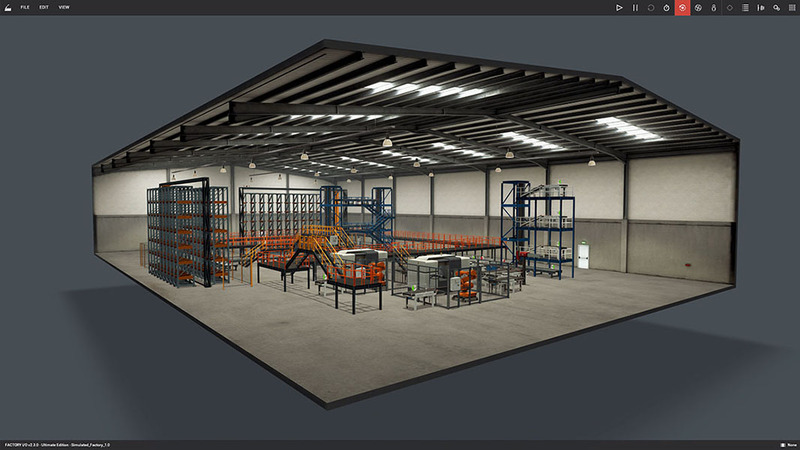 Camera: Added console command to restrict camera movement to the interior of the warehouse - default behaviour of previous versions: camera.restrict_to_environment. Camera: Added console command to change the vertical obliqueness of the camera frustum: camera.vertical_obliqueness. Camera: Added console command to move the camera to one of the saved positions: camera.position_index. Camera: Added console command to cycle between saved camera positions on a time interval: camera.position_cycle_interval. Core: Fixed frames drop when using hardware keys. Core: Fixed scene.start_in_run_mode throwing an exception. Console: Added physics.timestep and physics.max_substeps to console. These parameters allow you to increase/decrease the the quality of the physics simulation. Learn more here. Input: Mouse cursor in now locked at the window center when rotating the camera. Input: Fixed mouse scroll affecting cameras when mouse cursor outside window. 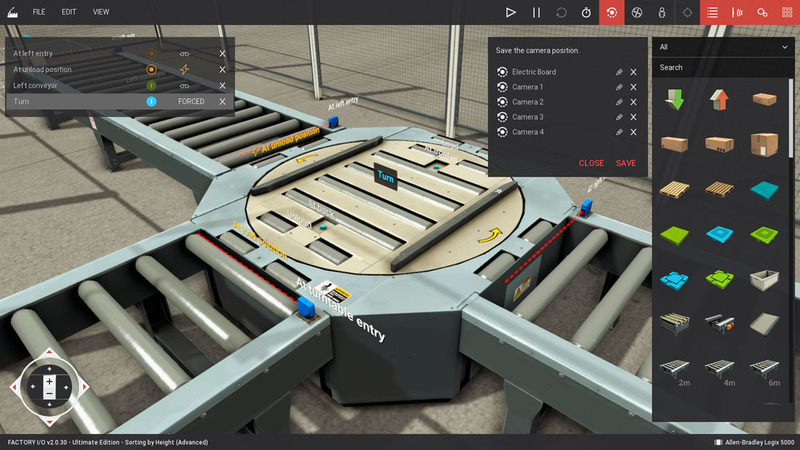 Scenes: Fixed Unload Conveyor tag forced by default in the Automated Warehouse scene. Scenes: Siemens PLCSIM tags are now properly mapped in the following scenes: Automated Warehouse, Elevator Basic and Level Control. Drivers: Fixed OPC Client driver not saving From Device parameter. Control I/O: Control I/O TOF timer now resets properly. Control I/O: Added J-K flip flop block. Core: Added command-line option and console command for starting scenes in Run mode. Drivers: Fixed driver changing when loading scenes before license check finishes. Drivers: Modbus TCP/IP Server allows choice of Network Adapter. 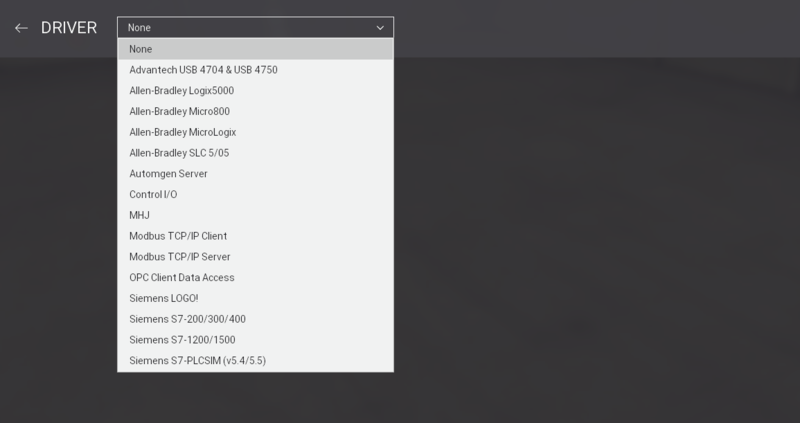 Drivers: Added console command for setting the S7-PLCSIM driver connection timeout. Input: Implemented alternative mouse movement calculation when running in a virtual machine or remote desktop. Added console command to force this alternative. Core: Fixed items showing in magenta after being removed by a remover. Drivers: Drivers with numeric data type are now loaded properly. Drivers: Added TIA Portal V14 project for Siemens S7-1200 sample. Documentation: Offline documentation updated to the latest version. Core: You can now copy/paste selected parts; also works between scenes. Core: Implemented Select All command. Core: Updated console help with new commands. Parts: New Analog & Digital Configuration available in controllable parts (that offer Analog configuration). Licensing: Implemented Cloud Licenses, these are similar to On-premise license servers but in this case we setup the license server for you on our server farm. Licensing: You can now manage your licenses through a Customer Portal. Localization: Software now available in French. Documentation: New documentation platform. Local documentation can now be set as the default one (use app.local_feed = 1 in the console or auto.cfg file). Core: auto.cfg file is now included in the installation folder. Core: auto.cfg file includes now the most common commands (commented). Core: Saved scenes display now the date and time of the file. Licensing: License broadcast can now be disabled (through console or auto.cfg file). On large networks, license broadcasting can be very slow. On these cases, you may disable broadcast to lower the startup time of FACTORY I/O. Parts: Fixed Vision Sensor not detecting the correct part after assembling a lid and base. Parts: Fixed Retroreflective Sensor creating a rising edge when switching from Edit to Run mode. UI: Fixed forced tags not reseting correctly when switching from Run to Edit mode. UI: Fixed incorrect color of the Run Mode button after unlocking "Lock Run Mode" in the instructor panel. Licensing: Fixed license messages not being displayed correctly if a trial license is present. Core: Fixed console text selection not working correctly. Installer: OPC dependencies are now correctly installed. Localization: Corrections on Russian text. UI: User interface translated to Traditional Chinese (option available in the Options Menu). UI: It's now possible to inject On failures by Left-clicking and Off failures by Right-clicking. This new feature allows to inject any type of failure without affecting the current tag's value. Licensing: Floating license server broadcast can now be disabled by using the console command license.broadcast = 0 (default is 1). Automatically finding a floating license server on large networks can block (or take to long) the search for licenses, not allowing to activate a license by using a key. Licensing: Fixed invalid corruption of stand-alone licenses detected on some Windows 10 systems. Parts: Two-Axis Pick & Place gripper is now properly detected by sensors. Parts: Removed incorrect configuration of Warning Light. Parts: Fixed Retroreflective reflector creating a rising edge when switching from Edit to Run mode. UI: User interface translated to German and Spanish (option available in the Options Menu). Core: Scene's tags can be exported to a text file by using the console command scene.export_tags(). Drivers: Siemens driver compatible with the latest LOGO! 0BA8 firmware. UI: Languages on the Options Menu are now displayed alphabetically. Parts: Fixed vision sensor not detecting any item when switching from edit to run mode. Parts: Fixed Right Positioner (misplaced physics colliders). Licensing: Minor fixes on licensing system. Drivers: New driver added for Siemens S7-PLCSIM v13/14. This driver allows FACTORY I/O to be controlled by a simulated S7-1200/1500 PLC through TIA Portal. UI: User interface translated to Russian (option available in the Options Menu). UI: Tags are always shown in the Driver Window, even when no driver is selected. Drivers: When connecting to a Siemens PLC over a network interface with more than one IP address, the driver now prioritizes the address that is on the same sub-network as the target PLC. Parts: Failures injection can be done on locked parts. Parts: Tags can be forced on locked parts. Core: The auto.cfg file is now first loaded (if exists) from the installation folder of FACTORY I/O and next from "..\Documents\Factory IO". This allows to define a global auto.cfg file which is not related to any Windows' account. Licensing: Trial license is automatically activated only if no other license is available. Core: Scenes changes are now properly detected. UI: Fixed Palette combo box not responding on some systems. Drivers: Fixed compatibility of v1.x licenses for Advantech and Siemens drivers. Parts: Fixed vision sensor always detecting all items after being set to one of the following configurations: "All Digital", "All Numeric" or "All ID". UI: User interface elements now support Unicode text. Options: User interface translated to Chinese (option available in the Options Menu). Drivers: Number of digital I/O points increased from 64 to 128. Drivers: Siemens LOGO/S7-200 driver allows actuators to be written to Q (default) or V memories. Licensing: Floating license servers support rehostable licenses (you may move floating licenses from one server to another). Drivers: Added Slot/Path to Allen-Bradley Logix5000 driver. Parts: Added new tags to Machining Center (door opened and machining progress). UI: Orbit camera focus automatically the selected part(s) after dragging it. UI: Increased Cameras Window size. Licensing: Trial license is automatically activated if no license is found. Parts: Rotating sensors using the context menu is done in smaller steps (1/10 of the old value). Parts: Doubled the range of the diffuse sensor. Parts: Stacker Crane velocity decreased by 30%, increasing the stability of pallets on forks. Parts: Movement of elevator platform improved, increasing stability when transporting items. Scenes: Drivers settings of included scenes (read-only) are no longer automatically saved. You may customize an included scene by saving and opening it from My Scenes. Cameras: Decreased Fly Camera speed. Drivers: Fix Item Limit of OPC driver not working. Drivers: Modbus settings now saves correctly. Parts: Two Axis Pick & Place rest position is the same on both digital and analog modes. Parts: Machining Center milling sound stops properly when switching from Run to Edit mode. Parts: Fixed some collision issues with the Conveyor Scale. UI: Follow part button now resets properly when switching between Run/Edit mode. Installer: Fixed some issues when installing on Windows 10. Welcome to FACTORY I/O 2.0! This release is packed with many great new features, including new Allen-Bradley, Siemens, and OPC drivers. It offers a redesigned user interface, 3D tags, new scenes, improved navigation, new editing tools and many bug fixes and enhancements. 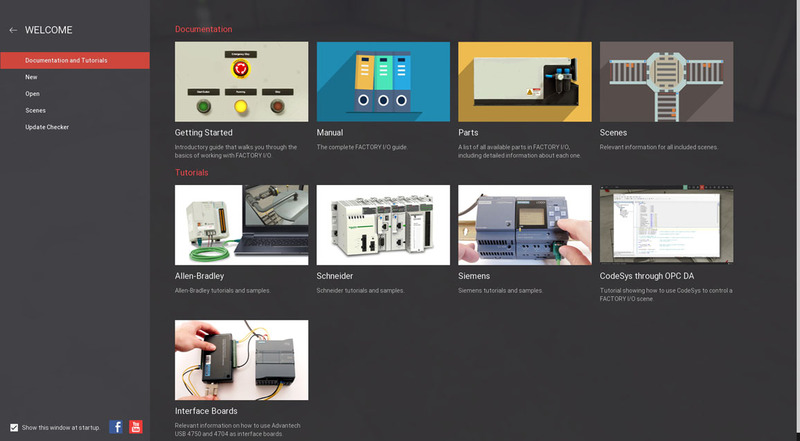 UI: Welcome Menu added with a set of quick shortcuts to the most important features of FACTORY I/O and links to the most relevant content such as Getting Started, Manual, Parts, Scenes among many others. Drivers: All drivers (except the Advantech USB 4704 & USB 4750) support "unlimited" number of I/O points. Drivers: Added Allen-Bradley Logix 5000. Drivers: Added Allen-Bradley Micro 800. Drivers: Added Allen-Bradley SLC 5. Drivers: Added CONTROL I/O (integrated SoftPLC). Drivers: Added OPC Client Data Access. Drivers: Improved Modbus TCP/IP with "unlimited" number of I/O points. Client can read from Inputs, Coils, Registers and Holding Registers. Server can write to Inputs, Coils, Input Registers and Hold Registers. Also, server can read from Coils, Inputs, Holding Registers and Input Registers. Drivers: Advantech drivers are now merged into a single driver. Now supports up to four boards simultaneously. UI: Right-clicking and rotating the camera will now draw the camera point of interest. UI: A utility grid is displayed when moving a part which helps moving it in the 3D environment. UI: Added a rotation gizmo to sensors which allow them to rotate freely around the local vertical axis. UI: You can now set the sensor range with a gizmo. UI: Sensor range can now be displayed in Edit and Run Mode. UI: Driver Menu background can now be set to transparent. UI: Walkways and Aligners are now customizable in 9 different colors: Blue, Cyan, Gray, Green, Orange, Red, Steel, White, and Yellow (Context Menu > Configuration). 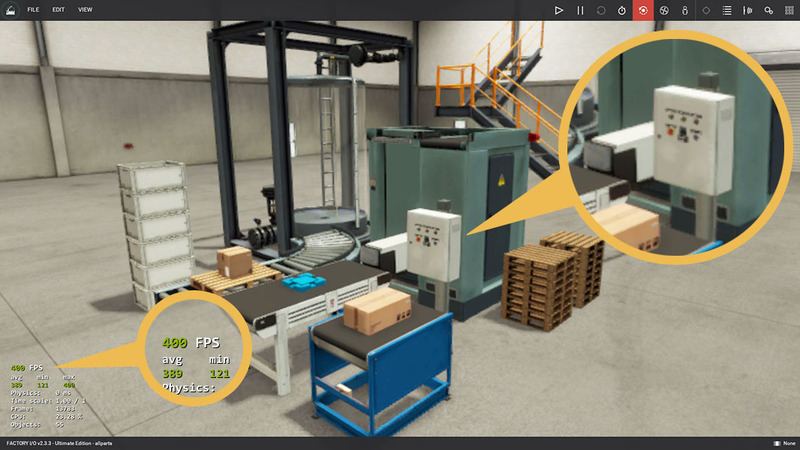 Editor: First-Person Camera can be detected by sensors (activated on the console or auto.cfg file). Graphics: Pallets were redesigned; instead of plastic, they are now made of wood. Graphics: Changed Emitter/Remover graphical appearance. Graphics: Redesigned Stack Light. Now it can be positioned anywhere. Graphics: Redesigned graphical appearance of Inductive and Capacitive sensor. Graphics: Added a new Screen Space Ambient Occlusion (SSAO) post effect (Very High quality only). Graphics: Chute Conveyor has been resized to the same width of Belt Conveyors. UI: Aligners grouped together in the Pallete. UI: Added proxy server fields to the Licensing Menu. UI: Scene tags were redesigned and are now 3D. UI: The Run button on the toolbar shows a lock icon if the scene is set locked to "Run Mode Only". UI: Changed UI mouse cursors. UI: Added a Driver Menu icon and link to the status bar. UI: It is now possible to use shortcuts to rotate parts (Y - Yaw; R - Roll; T - Pitch). UI: You can now Reset the simulation with a shortcut key (F6). Core: Added new Configuration to Pop Up Wheel Sorter: Digital (+/-) and Double Binary. Core: Discrete renamed to Digital. Core: autoExecute.cfg renamed to auto.cfg. Core: FACTORY I/O scene file extension changed from "FACTROYIO" to "factoryio". Drivers: Removed the Open (SDK) driver. When using the Ultimate Edition tags are available to external applications independently of the selected driver. Drivers: Merged Siemens S7-300 Ethernet and Siemens S7-400 Ethernet into Siemens S7-200/300/400 Ethernet. Drivers: Merged Siemens S7-1200 Ethernet and Siemens S7-1500 Ethernet into Siemens S7-1200/1500 Ethernet. Editor: Follow a Part now only works with the Orbit Cam. Editor: Only the Orbit Camera works when the scene is paused or running in slow motion. Editor: Increased the size of the Pop Up Wheel Sorter. Editor: Scenes are now sorted alphabetically, instead of chronologically. Editor: ChuteConveyor resized from 1,125m to 1m wide. Editor: Visual Status Indicator renamed to Stack Light. Editor: Improved moving parts when the camera is looking horizontally. 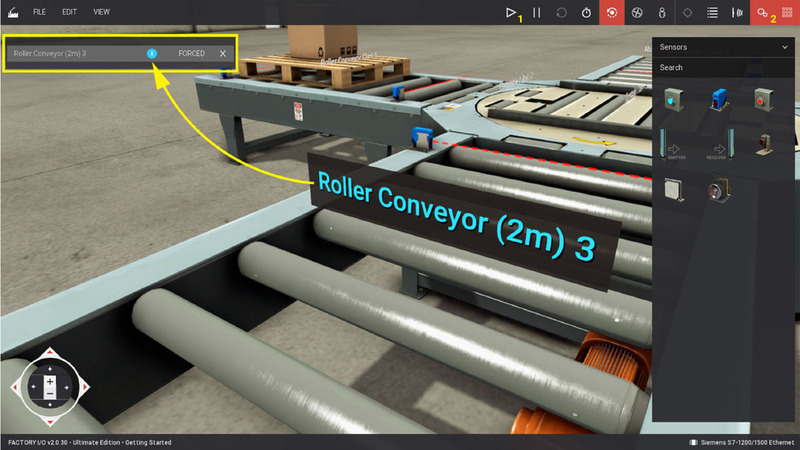 Editor: Changed names of categories: "Light Load Conveyors" and "Heavy Load Conveyors" to "Light Load Parts" and "Heavy Load Parts". Editor: German and Polish languages are no longer supported. Editor: Redesigned Walkways: now available in 4 sizes (S; M; L and XL) and Stairs were separated from the Handrail. Editor: Elevator Roll tags are now digital. Editor: Renamed Automgen TCP/IP Server to Automgen Server. Graphics: Turntable capacitive sensors resized. Graphics: Screen Space Ambient Obscurance effect replaced by Screen Space Ambient Occlusion. Graphics: Edge Detection removed as a post effect. Graphics: Bloom is activated by default. UI: Driver name displayed in the status bar can be used as a link to the Driver Menu. 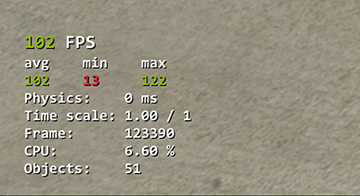 UI: Performance Bar removed. Now, a message is displayed if the simulation is running below 15fps. UI: Console includes a show_help() function to print all available commands. UI: Pick & Place gripper position is now marked with a red line. UI: Added Stations category to the Palette. UI: Scrollbars on Driver Menu only appear when the mouse is over the Sensors or Actuators list. Audio: Sound volume of all parts has been increased. Audio: Conveyor Belt Gate now makes louder impact sound when dropped. Drivers: Advantech 4704 analog values are now read and written by the driver. Drivers: Connected visual indicator of Automgen driver now shows if a client is connected (and not the state of the server). Drivers: Automgen will no longer display a warning if a client disconnects. Drivers: Fixed a problem of Advantech USB 4704 getting an object null reference on Read/Write. Editor: Fixed a problem where LightArray could not be renamed in the docked tag. Editor: Screenshot key (F12) now works on menus. Editor: Fixed Emitter and Remover not clickable in the Run Mode. Editor: When duplicating an Emitter, settings are also duplicated. Editor: Conveyor Gate no longer keeps running while opened. Editor: Fixed scene.time_scale command. Inserting a negative or zero value made the application crash. Editor: Fixed tags names being lost when switching Configuration on some parts. Editor: Fixed a problem of delayed physics, which was caused by controlling FACTORY I/O with Automgen from another computer (Host != localhost). Editor: Reset button now works properly. Graphics: Redesigned the Conveyor Scale. Graphics: Fixed Potentiometer graphical issues. Graphics: Fixed the graphical appearance of Roller Conveyor 4m/6m. Physics: Fixed Warehouse gate collisions. Physics: Fixed Belt Conveyor collision shapes. Physics: First Person camera now jumps correctly when running FACTORY I/O at high frame rates. UI: Fixed a bug that allowed the same key to be used for different actions. © 2006-2019 Real Games All rights reserved.